When we are hunting, we are hunters. Focused on the dogs, the field, the birds and the shot. But once you have that pheasant, quail, partridge or other bird in hand, you cease to become a hunter – if only for a moment or two – and become a cook. After all, sharing our daily bag at the table with friends and family provides the exclamation point to any hunt. But no one wants to eat stinky, rotten pheasant. 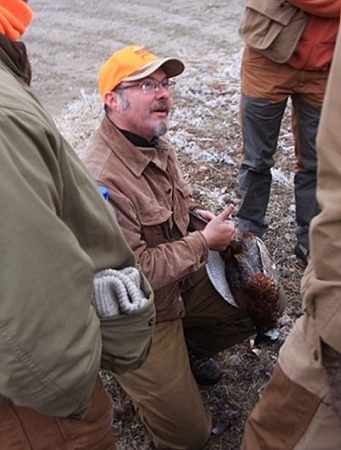 Here are some of the most common game care mistakes I see in the field and in the kitchen. All of us are guilty of one of these or another, but if you do your best to minimize your errors you will find that the quality of your wild game meals will improve exponentially. I live in Northern California, and quail hunting out here can be a sweltering affair. It’s not uncommon to hunt quail in 90-degree weather or worse, and even when our pheasant season opens in November it can still routinely reach 75 degrees on a sunny day. And I’ve hunted sharp-tailed grouse and pheasants in the Midwest and quail in the South in warm weather any number of times, so this is not just a Western problem. Temperatures hotter than 60°F are dangerous for your birds – especially if you stuff them in the back of your vest! You are hot, the birds are hot and that vest encloses them in a steamy, bacterial swamp. When it’s warm out, I prefer to use a leather game strap that I clip to the loop on the back of my game vest; most vests have them. That way the birds can swing in the breeze as I continue to hunt. When you are back in the truck, don’t pile up your birds. This concentrates heat and can cause spoilage in a hurry. Lay them side by side so they can cool off, and in truly warm weather - 75°F or hotter - bring a cooler. It matters. A lot of hunters skin their birds. I rarely do this with upland birds, but hey, to each his own. Skinning is indeed fast, but it also exposes the meat to the outside world and that world has lots of bugs that can make you sick. I see a great many people who skin their birds wash them off afterward to get stray feathers, guts, etc off. They then stick the bird into a plastic bag and call it a day. This is a recipe for a bacterial hootenanny. Most of us know that you don’t rinse the cavity of the deer we hunt, right? Right? You dry it off with paper towels or cloth. Do the same with your birds and you will vastly minimize your food safety risks. Water becomes your friend when you are ready to cook or freeze your birds. Only then do you want to rinse or brine your pheasants or quail – and even then many people frown on that. I actually prefer the flavor of a pheasant that’s only been wiped clean with a damp cloth. I find that thorough rinsing and brining leaches flavor and makes a pheasant little more than a boring chicken. You’d think tossing the birds on a bag of ice in a cooler would be a good idea, right? It is and it isn’t. In a cooler, bags of ice are in a constant state of melting, so there’s a lot of liquid water around. And as we just learned, water is not your friend when it comes to birds in the field. There is a simple solution: Create a barrier between the pheasants or quail and the ice. I do this in one of two ways. The best way is to have a plastic Tupperware container that just about fits the inside of your cooler. Put the ice in first, then the container, then the birds go in the container. It’s a great solution. Easier but less effective is just to put a layer of burlap or plastic (like a trash bag) between the ice and birds. It’ll work until you get home. You need to wrap your pheasants and quail tightly, preferably with a vacuum sealer. If you don’t have one, wrap the bird in plastic wrap twice, then in either butcher’s freezer paper or foil. Do not forget the plastic wrap step or you will have a ruined pheasant – that foil will degrade over time and destroy the meat. This should go without saying, but clean your birds with clean hands, OK? And do it in as clean an environment as possible. One of the chief causes of meat spoilage is contact with nasty bacteria, and that often happens because you’ve cleaned the critter in a dirty environment. Now you don’t need to be antiseptic, but use some common sense: Make sure the back your tailgate is clean, or your cutting board or whatever. Hot soapy water in between hunts is fine. I can hear some of you saying, “Well I’ve cleaned pheasants on my tailgate for years and I’ve never gotten sick.” Maybe so. But chances are you will, sooner or later. Why take the risk? Speaking of risk, if you have cuts on your hands, wear gloves. I mean it. I know several guys who have contracted tularemia, brucellosis and/or trichinosis from gutting game animals with bare hands. They had some recent cuts on them, and their blood came in contact with the animal’s. This is less of a risk with birds, but still – better safe than sorry. If I had a dollar for every time I’ve seen someone try to thaw out a frozen bird in hot water I’d be able to buy a new shotgun. Even chefs mess this one up. Thawing frozen meat in hot water will destroy the bird and create a bacterial soup. The warm water cooks the outside of the meat, waterlogs it and makes a perfect environment for harmful germs. Thaw in a cold environment. Best is overnight in the fridge. Second best is to drop the vacuum-sealed pheasant into a big pot of cold water. The water will steal the cold from the pheasant and equalize, so both the bird and the water become cold, but not frozen. It’s exactly the same thing that an ice cube does. A member of both Pheasants Forever and Quail Forever, Hank Shaw is a hunter, cookbook author and award-winning writer. His website is Hunter Angler Gardener Cook (www.honest-food.net). He lives near Sacramento, Calif.